Back by popular demand, join us for the ultimate Irish holiday dance party! 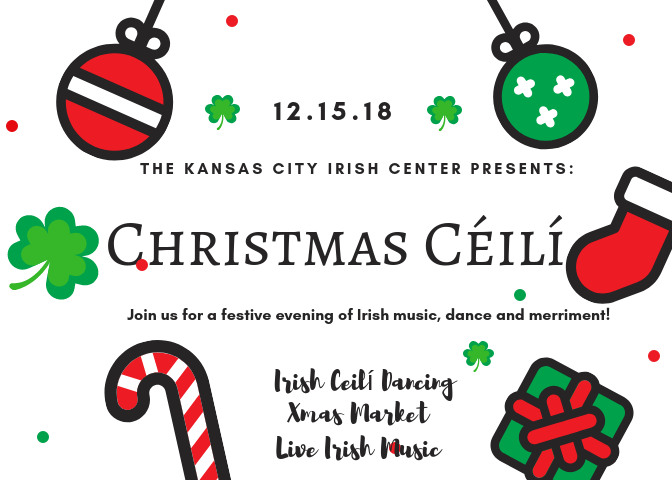 With a little help from the lovely dancers of Céilí at the Crossroads, we’ll have plenty of instruction for those of you not familiar with Céilí dancing (it’s similar to square dancing), local Irish musicians providing the tunes, a Christmas market featuring local Kansas City artists, and of course plenty of holiday food and drink! Wondering what is appropriate attire for a Christmas Céilí? Hint: No holiday party is complete without an ugly sweater contest….in case that helps with your wardrobe decisions! Cost is $10/person – children under 12 are free.